Easter for me, like so many others, has always been about Jesus and candy, but now it is also inexorably tied to the memories of my sons’ births. Nine years ago, wearing a dress never designed for such unrelenting girth, I waddled my way across a hot Texas parking lot to attend Mass on Easter morning. My oldest son was born three days later. Five years after that, my youngest son was born in the darkest hours of another Easter morning. By that time, though, I had stopped attending church, so luckily there was no disruption in plans. These days Easter in my home is more about family traditions and childhood delight than solemn remembrances, but I figure if Hobby Lobby is offering up a tribute to Jesus today, then I should as well. Below is a new version of the Lord’s Prayer, read with new eyes, heard with new ears. Neil Douglas-Klotz is a religious scholar who offers fresh and surprising translations of a few of the prayers and sayings of Jesus in his slim volume, Prayers of the Cosmos. 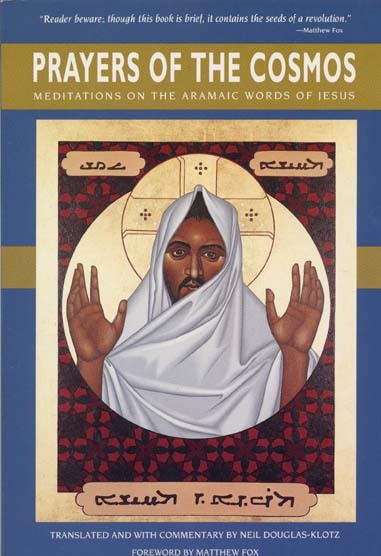 By translating Jesus’s words from the original Aramaic, as opposed to using later translations made into Greek, Douglas-Klotz is able to access the deeper, mystical meanings in Jesus’s words. The result is moving, inspiring, even perhaps a little shocking. In honor of Jesus’s life, spring, and the immeasurable gift I received and continue to receive in my two sons, I offer you this gift today. First the old prayer . . .
And now the new . . . Loose the cords of mistakes binding us, as we release the strands we hold of others’ guilt. From you is born all ruling will, the power and the life to do, the song that beautifies all, from age to age it renews. Truly—power to these statements—may they be the ground from which all my actions grow: Amen.